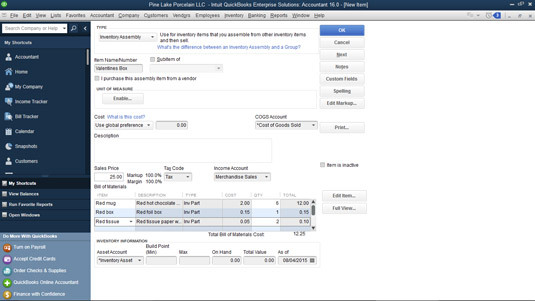 QuickBooks Premier and Enterprise Solutions include a cool tool for accounting for the manufacture of items. Suppose that Pine Lake Porcelain, an example business, mostly just buys and resells coffee mugs and other porcelain doodads. But also suppose that once a year, Pine Lake Porcelain assembles a romantic collection of red coffee mugs into a boxed St. Valentine’s Day gift set. In this case, QuickBooks can record the assembly of a boxed gift set that combines, for example, six red coffee mugs, a cardboard box clad in shiny red foil, and some red tissue paper. Each component that makes up the assembly — in this example, the St. Valentine’s Day boxed gift set — needs to be an item on your Item list. The assembled item also needs to be an item on your Item list. If you box up six red coffee mugs using a couple of pieces of tissue paper, you need individual inventory part items for the coffee mugs, the box, and the tissue paper. And then you also need an assembly item that says the gift box includes six red mugs, a red box (say), and then also a couple of pieces of red tissue paper loved ones can use when they become emotionally overwhelmed by the generosity of this thoughtful gift. Here is the New Item dialog box filled in so as to set-up a Valentines Box assembly item. In the top-middle portion of the window, QuickBooks shows the quantities of the assembly that you have on hand and for which customers have placed orders. That’s pretty useful information to have, so, hey — remember that it’s there. When you build an item, QuickBooks adjusts the inventory item counts. For example, in the case of boxed gift sets — each with six red coffee mugs, one piece of wrapping tissue, and a cardboard box — QuickBooks reduces the item counts of red coffee mugs, wrapping tissues, and boxes, and increases the item counts of the boxed gift sets when you record building the assembly. Some of the components used in an assembly may not be inventory items. 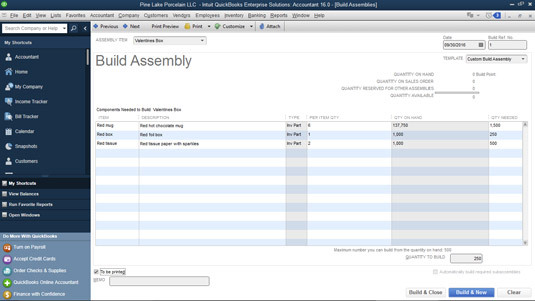 When you use non-inventory parts in an assembly, QuickBooks doesn’t care about the item counts.